University of Pittsburgh Press, 9780822944423, 224pp. Based on the author’s own experience of losing her husband at age thirty-seven, this book explores the resulting grief, fury, and bewilderment, mirroring the obsessive nature of grieving. The stories examine the universal issues we face at a time of loss, as well as the specific concerns of a young widow: support groups, in-laws, insurance money, dating, and remarriage. This Angel on My Chest ultimately asks, how is it possible to move forward with life while “till death do you part” rings in your ears—and, how is it possible not to? Leslie Pietrzyk is the author of two novels, Pears on a Willow Tree and A Year and a Day. Her short fiction and essays have appeared in many journals, including Gettysburg Review, The Sun, Shenandoah, River Styx, Iowa Review, TriQuarterly, New England Review, and the Washington Post Magazine. She has received fellowships from the Bread Loaf Writers' Conference and the Sewanee Writers’ Conference. Pietrzyk is a member of the core fiction faculty at the Converse low-residency MFA program and teaches in the MA Program in Writing at Johns Hopkins University. She lives in Alexandria, Virginia. 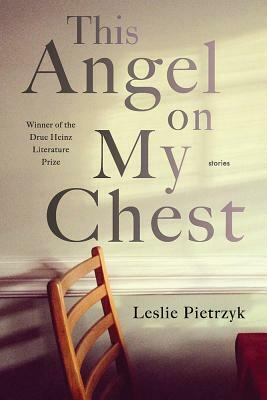 "With a delicate balance of cleverness and emotion, the sixteen stories in Pietrzyk's collection explore the event of her husband's sudden death at the breakfast table in 1997. . . . The author's wit, clarity, and literary inventiveness dance circles around the omnipresent sadness, making this book a prime example of the furious creative energy that can explode from the collision of grief with talent and craftsmanship. . . . Running through them are recurrent details that add the weight of obsessive memory: a carefully organized library of books, a bowl of cornflakes, the music of Springsteen (a misunderstood line of which gives the collection its name), an extramarital affair. Pietrzyk explores every aspect of the truth, including the parts you have to make up, and never gives in to sentimentality or self-pity. . . . This book is the winner of the distinguished Drue Heinz Literature Prize, upholding its tradition of excellence in short fiction. Like Magic Rocks in a fishbowl, these stories turn the stones of grief into something bright, crystalline, mesmerizing."